Is your marble polished or honed? Master craftsmen have used marble, a kind of white limestone, for centuries in historical works from the Taj Mahal to Michelangelo’s David and Moses sculptures. Today, it remains a popular and prestigious material. Elegant and naturally beautiful, the depth of its patterning and unique markings make marble a luxurious choice in modern homes and businesses. So no wonder people use it in everything from table and countertops to flooring. Marble with a glossy finish is especially susceptible to marking. Meanwhile if you have a matte finish, this reduces these imperfections. Before you undertake any cleaning yourself, understand what kind of marble you have. This has a velvety finish and has been sanded, and although it’s not matte exactly, it’s certainly not a shiny surface either. Because it’s not as slippery as polished marble, it’s ideal for floors. It’s also less likely to show up scratches or etching than its shiny counterpart. More common in kitchens in countertops and the like, this kind of marble is not less porous than honed marble. So it should not stain as readily, and you can typically seal it less often. Additionally, many like its attractive shine, which can help a smaller kitchen look bigger than it is. 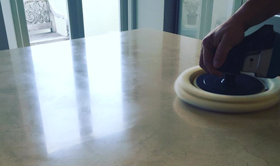 It is possible to change a honed marble surface into a polished one, and vice versa. But that’s a job for professionals with the right specialist equipment; specifically a stone-polishing machine. Depending on what kind of marble you have, you can decide what to do to keep it looking its very best. You may choose to do the simpler tasks such as basic routine cleaning yourself. Essentially, however, marble care is generally best left to professionals. They have the right expertise and experience, especially for bigger projects like marble restoration or complex repair jobs. Talk to us at Royal Stone Care before you do anything else. We help with all aspects of marble care in London and around, from cleaning and polishing to complete marble restoration. Give us a call to discuss your needs today. This entry was posted in Marble, stone cleaning and tagged honed and polished marble, honed marble, marble care london, marble polishing, marble restoration. How terrific terrazzo could enhance your home! How your driveway could benefit from pressure washing?